Bisley 15 drawer units in a choice of four colours and available from stock for a free next day delivery. Comes with label holders and Chrome handles and a five year factory guarantee. Bisley multi drawer filing units are available in a choice of 3 carcass colours, Black, Grey or Coffee & Cream. Manufactured to a high standard in the UK, these are delivered for free to any UK mainland address within 5-7 working days from order. 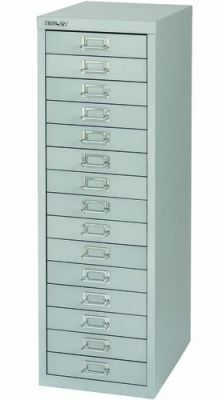 These filing units are installed free of charge as well and come with a standard 5 year factory warranty.